Pineville City Hall is located at 910 Main Street, Pineville, LA 71360; phone: 318-445-7163. Photo: Cottingham House, ca. 1907, Cottingham Drive, Pineville, LA. The house was built or Dr. and Mrs. Claybrook Cottingham. Dr. Cottingham was then one of three faculty members at Louisiana College, which had opened in October 1905. He served as president of the college from 1910 to 1941. Listed on the National Register of Historic Places in 1987. Photographed by User:Karen Gauthier 0809 (own work), 2014, [cc-by-3.0 (creativecommons.org/licenses/by/3.0)], via Wikimedia Commons, accessed February, 2016. Pineville, the sister City of Alexandria, is one of the oldest settlements in the State of Louisiana as it was a stopping place on trade routes of early explorers and traders. St. Denis stopped at Pineville in 1700 and records show that it was well known to French explorers on the Red River after that time. Pineville is located on the east bank of the Red River and at that time the Spanish government claimed Red River as the boundary between Mexico and the French Territory of Louisiana. However, the establishment of a mission chapel at Pineville in 1711 showed that in their claims they included church property beyond the river. The mission chapel was built in what is now the Old Catholic Cemetery. The site of the old mission is unmarked but it is near the grave of Dr. Emmanuel Muellion, once commander of the Post of Rapides, under the Spanish regime. Dr. Muellion held the position when this territory was ceded back to France and then to the United States. Dr. Muellion died in 1820 at the age of eighty-three. One hundred and ten years later his resting place was marked by the Daughters of the American Revolution as a Revolutionary Patriot. William Miller was an early Indian Agent and a partner of Alexander Fulton who platted the Town of Alexandria. There are hundreds of descendants of this early settler, Ennemond Muellion, in the State of Louisiana. When Muellion moved to Rapides Parish he opened a cotton plantation on Bayou Reef. Between 1880 and 1833 John David and F. Poussin came from France and opened a store at Pineville where they conducted a prosperous business. Prior to the Civil Way Pineville had a population of less than 100. During the Civil War, Federal Troops were stationed in the City and much of the pine forest of what is now the city was out by the Yankee Soldiers at this time. Some of the early residences were used by Federal officers during the Red River Valley Campaign. 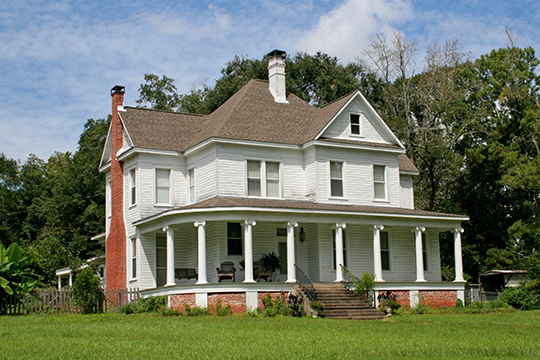 The Carrie Boyee house, the first residence to the left after crossing the Red River from Alexandria, is an ante-bellum home and is said to have been the scene of a Court Martial trial during the War. Several stores were established immediately after the was when Pineville was a meeting place for Federal Troops. The National Cemetery at Pineville was established in 1867. Most of the soldiers buried here are Federals. A post office was established in Pineville in 1871 and the town was incorporated in 1878. Works Progress Administraiotn of Louisiana, Early History of Pineville, Louisiana,, 1930, State Library of Louisiana, louislibraries.org, accessed February, 2016.